Home Lighter Notes How Students from South Asia can Prepare Themselves for Studies Abroad? How Students from South Asia can Prepare Themselves for Studies Abroad? Students, who have the intrinsic drive or the privilege of managing the monetary means, are ever so increasingly taking the decision to study abroad. The experience, the feeling of a new and untouched city is unmatchable. As a student, the take on a city is entirely altered, even if you have lived in the city before. In any given university/college, a South Asian student can definitely be spotted. Considering the territory that engulfs South Asia is big enough to constitute for 24% of the entire world population, you are ought to come across one. The pattern of international student mobility is in a continual state of flux with recent researches pointing towards Asia being the power engine that gives rise to global growth in the field of international education. Europe, the United Kingdom and the United States of America make it to the top of the list for the academic destination of South Asians. Once you have the acceptance letter in your hand and have chosen to hop onto an expedition in your life, there comes an array of aspects you have to prepare yourself for. Every student has a different take towards it. Some have been mentally prepared from the very beginning to partake the journey. For some it might just be a slight adjustment. Nevertheless, it a process a student goes through. It is an alteration to the current life. You are to leave your home country and leave for a familiar or absolutely unfamiliar city. For either of the cases, one is supposed to prepare for whatever may come. The beginning of this voyage (as I like to call it) is commenced with mentally preparing for it. This is the first and the foremost pivotal step which lays the basis of the expedition one is about to begin. Adjustment – the first rung of the ladder. It is all about the way you train and trick your mind into tackling the adjustment issues. Learn to be a more flexible person. Be ready for all that life has to offer you because it has the capacity to intimidate you, daunt you, throw you off the edge and make you stand taller at the end of it. Take it as an experience that will teach you at least a dozen aspects of yourself, life, others and the world and I believe, that is the beauty of it. Realize that you have to be more open-minded, be more accepting of change and people. You are stepping into a whole new world that you are not used to of, and maybe, that world won’t be accommodating towards you either if you are not malleable enough. Take all these aspects, make a concoction and do not forget that you are leaving your country for something greater, in terms of exploration. Conquering step 1 requires fine-tuning of yourself and once you are there, you are ready to step into figuring out the logistics of the experience. The experience works on mental and physical levels. A student works its way up. There is a great chance for a South Asian student who is going abroad to face a challenge academically. Isn’t that the purpose of academics? To strive for greatness. Hence, it is just as imperative to be rightly equipped for it. Make sure to know what the course has to offer and what you are to gain from it – if those two are in sync with what you have expected from yourself. From the syllabus/course outline to the professors who could potentially be your future research supervisors. Be thorough. Be very through. Do your research. Know what to expect and leave a little room for surprise. Because isn’t a little surprise always a challenge? Expect to have people more thoroughgoing than you and that is not necessarily a bad thing. Take them as a source of knowledge. Universities abroad have a diverse pool of students. People from every walk of life who have the competence and aptitude for the course will be in the same classroom as you and it is always a plus to be primed for such an experience. This step seems kind of duh! Trust me, it can be an ugly thing to not be used to of piercing cold weather and on top of it, being a picky eater. The best way to go about this stage is to ask as many people as you can about the appropriate clothes for the weather of your destination and, as far as food is concerned, you’ll figure that out. These three steps, according to me, are the ones that should be thought through unless you want to dive into it blindly. It’s up to you. All the above may seem incredibly obvious to you, but it is always good to know which direction to look into. Irrespective of the fact if you want to settle down abroad after your studies or not, it is a whole new world out there to reconnoiter and make it your own. In the process, you may leave pieces of yourself all around the city while you’re at it and that might just help you grow even more, learn even harder and cope even better. 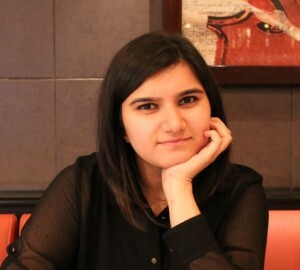 Kanza Aijaz has completed her MSc in Clinical Neuroscience from King’s College, London and BSc in Applied Psychology from Beaconhouse National University, Pakistan and is currently working for an NGO in Lahore, Pakistan.